When I lived in Hayward, 2013–2014, I avidly anticipated the opening of Brews & Brats on B Street, one of several new restaurants moving into the downtown strip at the time. Alas, Brews & Brats still wasn’t open by the time I moved to Oakland, but now, a year later, it’s fully established. As I was due for a visit to my optometrist up the street, I decided now was the time to finally check this place out. The interior is more casual than I expected, consisting of a handful of tables and a prominent bar. There’s not much seating–we were lucky to cram four people around one of the dark, wooden tables. But somehow, that makes the place feel like a natural extension of Hayward’s vibe. Popular with sports fans, the restaurant’s televisions provided the majority of the background noise. Patrons were mostly singles at the bar, and the dining area seemed more like bar overflow space, though table service from the bartenders was prompt and ours had a great sense of humor. 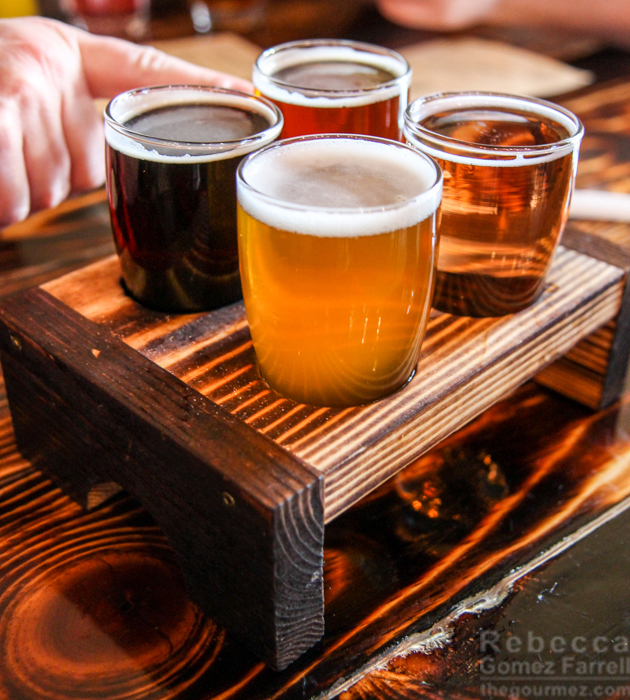 As usual, I went for a beer sampler–part of why I’m a blogger is because I have to TRY IT ALL. You pick your own selections (4 for $8), so I went for two fave styles, a chocolate porter and a cider, and two beers with the funniest names to say, the Amarillo Pillow and the Toaster Pastry. As feared, the cranberry cider was a tad sweeter than I like, though Friend #1 said the cherry cider was quite tart, so I may try that on a return trip. The chocolate porter was everything it should be, rich and filling. The other two beers were both quite good and moderately hoppy. The Toaster Pastry was earthier and deeper, and the Amarillo Pillow felt like a fleeting visit to sunbathed shores. It’s the Pillow I went for when ordering a second pint. Food is reasonably priced and includes various sausages made in-house and a barbecue menu including tri-tip, pork ribs, pulled pork, and smoked salmon. The sausages may seem expensive at $7.50 each, but the size is definitely filling. Only my husband was able to order a second, and even that was after much consideration of whether it was wise. The standard dog comes with onions, red bell pepper, and a gentle sauerkraut. Yellow mustard and ketchup are, of course, on the table. Of the nine sausage varieties, two of us chose chicken cheddar and jalapeno dogs, I went for the jerk chicken, and Friend #1 opted for swedish potato. That’s my husband’s cheddar and jalapeno dog made “shroom” style, which is one of six topping combos that can be added on for $2.00; individual toppings are 75 cents each. 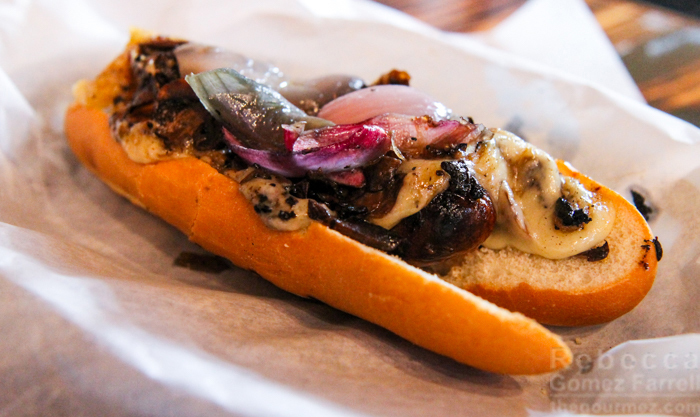 Shroom style adds swiss cheese, mushrooms, and sautéed onions. As you can see, the toppings are generous. Friend #2, who had the same sausage, found it came quite moist and with a good amount of heat. 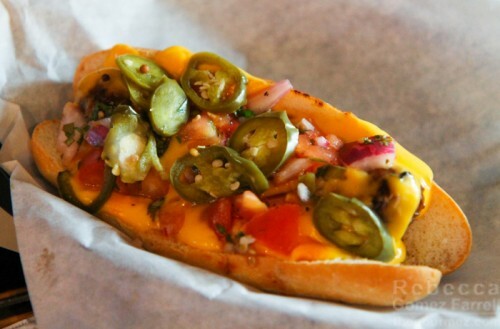 His was topped as “the bracho”: nacho cheese, tomato relish, and jalapenos. We’ll just pretend that picture can double as my own sausage as well, as I forgot to take a picture before diving in. I, too, chose to add on nacho cheese, and for a time, Friend #1 and I were lost in memories of Orange Julius’s majestic nacho cheese dog. I’ve waxed poetic about that before, so I’ll spare you the details here. I did think the complimentary onions and bell pepper were plenty of toppings on their own, as long as you add something to moisten the bun. My jerk chicken dog was impressively spicy, and I too found the meat moist and flavorful. We were surprised that the much milder swedish potato dog still conveyed a little kick of its own. That was Friend #1’s, and her dog tasted dry at first, so she dove for the ketchup and thought it went very well with the potato-laced sausage. Potatoes and ketchup? Who’d have imagined such an amazing combination? 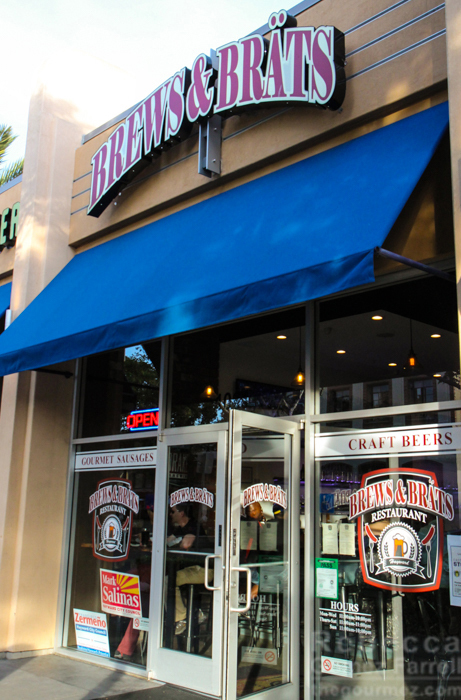 Brews & Brats is a great new addition to the Hayward dining scene, but if you go, be prepared for a very relaxed experience. This is a kick-back-and-watch-the-game sort of place. With great sausages and beers, that’s not at all a bad way to spend the evening. And if you do go, please let me know how the bacon-topped potato salad is, because I love the idea that you can order it with or without bacon when bacon is part of its name.